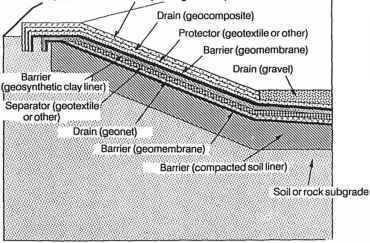 The control of contaminant migration from existing disposal sites or impoundments may necessitate a vertical subsurface barrier to horizontal groundwater flow. Barriers commonly constructed include soil-bentonite slurry trench cutoff walls and cement-bentonite slurry trench cutoff walls. Vibrating beam cutoff walls, grout curtains, sheet piling, and composite walls are also used. For vertical barrier walls to be effective, they are generally keyed into an impermeable stratum of natural materials beneath the site, although this is not required in all cases. Figure 6 Schematic drawing of section of slurry trench excavation and backfill. 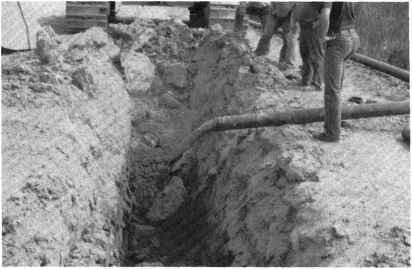 Figure 7 The excavation of a slurry trench. for the formation of a filter cake along the walls of the trench and for sufficient fluid pressure to result in a computed factor of safety greater than 1 for trench stability [2,28,29]. Trench depths can generally reach about 10 m using conventional backhoes. To achieve greater depths (up to about 17 m), a modified dipper stick is required and can be provided by specialty slurry wall contractors. To go deeper than 17 m usually requires the use of a clamshell, and an extended backhoe capable of excavating 22 m has been developed . Typical cross sections of a slurry wall during excavation and after backfilling are shown in Figure 8. Upon the completion of excavation under the head of bentonite-water slurry, the trench is backfilled with a mixture of soil and bentonite (added by way of the bentonite-water slurry). The mixture of soil and bentonite-water slurry typically has a consistency similar to that of high slump concrete. Soil-bentonite slurry trench cutoff walls can generally develop a hydraulic conductivity of 1 X 10~7 cm/sec or less. For the design of a soil-bentonite slurry wall for waste containment, studies are required beyond those typically required for conventional dewatering applications. Chemical analysis of samples of on-site materials considered as potential backfill materials may be required. Leachate compatibility tests must be conducted using the site liquid as a permeant. The overall permeability of cement-bentonite cutoff walls (typically about 1 X 10 6cm/ sec) is generally higher than that of soil-bentonite walls. Laboratory testing of a cement-bentonite mix for a plastic diaphragm wall is discussed by Gill and Christopher . 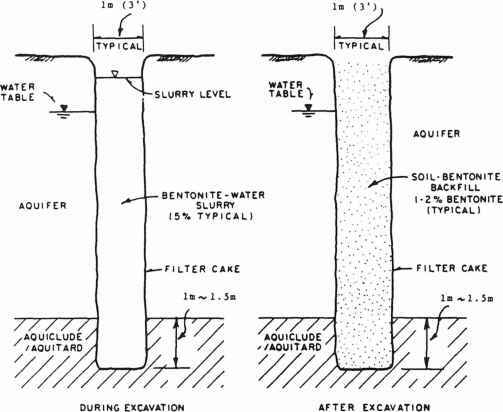 Figure 8 Typical section of a soil-bentonite trench cutoff wall (a) during excavation and (b) after excavation. A concept for constructing a composite vertical impermeable barrier to prevent the migration of contaminated groundwater or leachate from a hazardous waste site or waste disposal area is described by Druback and Arlotta . The composite system is a hybrid cutoff wall constructed with high-density polyethylene (HDPE), and sand backfill and is installed using the slurry trench construction method. When properly installed, a low-permeability composite vertical barrier results that has unique engineering properties, including improved chemical resistance, leak detection, and groundwater migration control. Vertical barriers to horizontal groundwater flow have been designed and constructed using the vibrating-beam injection method as shown in Figure 9. This technique uses a vibratory-type pile driver to cause the penetration of a beam of specified dimensions to the design depth. Slurry is added through injection nozzles as the beam penetrates the subsurface soils and as the beam is withdrawn. How do i know trench excavation from drawing?